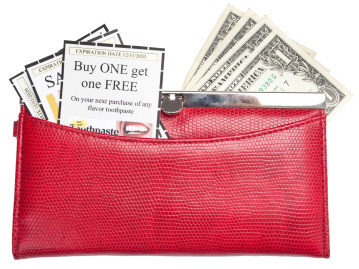 You’ve heard it before: “Coupons are a waste of time! What’s the use in saving 40 cents? They’re too much of a hassle.” I used to think like that until a few years ago. But now I know better. After a few minutes, the coupons were scanned, and to the amazement of the woman behind me, I saved $80! Original total: $100, savings $80 (80 percent) — and only $20 out of pocket. How did I do it? A few years back, as a new stay-at-home mom and living on one income, I knew I had to find a way to save money at the grocery store and stockpile necessities like diapers. I started clipping the coupons in the Sunday paper. Then I moved on to magazines and local fliers that came in the mail. I started out using just an envelope for coupons, but as I got more involved in couponing, my storage system grew into a three-ring binder, complete with plastic baseball-card-holder pages to hold the coupons. This system has worked well for me the past few years. Here are seven great ways you can save with coupons — starting right now! This is the most obvious place to save money with coupons. The biggest secret of people who save the most at the store are those who match coupons with “loss leaders” — those heavily discounted items they feature in their ads in order to get you through their door. I have gotten jars of Ragu spaghetti sauce for 50 cents, bags of brand-name diapers for $4, Gerber baby food for 20 cents a jar — and have taken advantage of many other great offers. Articles about the frugal lifestyle usually recommend always cooking at home. This is an obvious way to save money, but sometimes you need a treat or a break from the kitchen! I’ve saved on eating out by purchasing the Entertainment book, clipping coupons from the local Pennysaver fliers, buying coupon booklets (for instance, at Halloween, McDonald’s sells a coupon booklet) and of course, offers that are featured in the Sunday newspaper. And while saving is good, what about free? If you sign up for the mailing list on the website of your favorite restaurant, many offer free food for your birthday. (See a great list of birthday clubs here!) Also, keep an eye out for restaurants that offer “Kids eat free” nights each week — you can usually get two free kiddie meals with the purchase of one adult entree. Find out about restaurants that have clubs or special offers right here. I never pay full price for an oil change or any other routine service on our cars. We receive coupons in the mail from the local franchises and dealerships, and we use those to save $10 or more off the normal cost of an oil change. If you’re going in for warranty work on your vehicle, some dealers will change the oil — and wash your car — free of charge. For household maintenance, we subscribe to Angie’s List to find the best plumbers, landscapers and more. Angie’s List also includes coupons, both on the website and in their monthly magazine. I’ve found there are always movie rental coupons around. Whether it’s a 99-cent rental for Blockbuster or a free rental at Hollywood Video, get video rental cards for both places and take advantage of those coupons! Also check out places to rent movies online — they will either be mailed to you or you can download them to your PC or TiVo. Look into Netflix and Amazon.com’s Unbox on-demand download service. Sure beats paying $4 per rental. Do you often find coupons for things you just don’t use — such as diapers, frozen meals or a certain brand of shampoo? Consider starting a local coupon exchange club. Get together with a few friends once a month, clip all the coupons you can find and swap the coupons you don’t need for the ones you want. You can also find coupon exchanges online, including one at couponless.com. My motto is “Never pay more than I have to!” This includes finding the best deals online. Whether it’s free shipping or 10 to 20 percent off, it’s worth looking for promo codes. Check out the Points & Prizes blog for coupon codes, freebies and contest links, updated daily. You can also visit amazing-bargains.com for a list of thousands of coupon codes for online stores. Once you get started saving money by couponing, you’ll be hooked — and you’ll be that much richer, too!